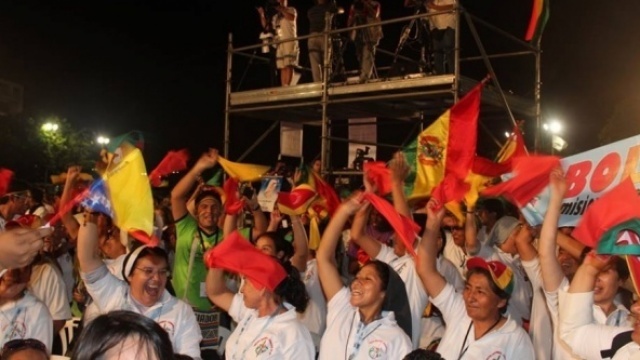 Bolivians celebrate as it is announced that the next Missionary Congress will take place in their country in 2018. This an adaptation of my homily for the second Sunday in Advent, Year A. The readings were: Isaiah 11:1-10; Psalm 72; Romans 15:4-9 and Matthew 3:1-12. On this Solemnity of the Birth of John the Baptist it is good to reflect on the meaning of being a “voice”. The voice crying out in the wilderness “prepare the way of the Lord!” I love John the Baptist. He’s my role model. I guess we can say that John the Baptist is the first proclaimer. Maybe we can say that he is the first missionary. I’ve been thinking about missionaries a lot for a number of reasons. The first is that last November, Pope Francis published his first Apostolic Exhortation. It’s not like an encyclical, or a letter; it’s more like a book! It’s 214 pages! 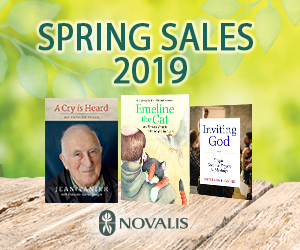 It’s called Evangelii Gaudium: The joy of the Gospel. And he writes about a lot of things, all in the context of the joy of the Gospel and the joy with which we should always share the gospel. In it he writes, “I am a mission on this earth.” [EG 273] That really struck me. It’s more than simply I am called to be a missionary or I have a mission: I AM a mission. And he doesn’t mean that he alone is mission; he means that all of us are mission. We are the mission of the Father: The Church is the mission of God. And who better to say that about than John the Baptist? John was mission. On the day he was born his Father, Zechariah (remember he had lost his voice because he doubted the angel) regained his voice and prays a beautiful canticle (Luke 1:68-79), the Canticle of Zechariah: “You my child shall become the prophet of the most high, for you will go before the Lord to prepare his way; to give his people knowledge of salvation, by the forgiveness of their sins.” From the day he was born, John had a mission and he became that mission: to prepare the way. Even before Jesus himself was proclaiming the Good News, John was proclaiming the Good News. I’ve actually been thinking about mission since this summer at World Youth Day. That event was all about mission: Go be missionaries. The theme was from Matthew 28:19, “Go make disciples of all nations.” That passage has been my favourite since my first World Youth Day in 2002. In fact the whole section, from verse 28 to 20 is my favourite: “All authority in heaven and on earth has been given to me. Go therefore and make disciples of all nations, baptizing them in the name of the Father and of the Son and of the Holy Spirit, and teaching them to obey everything I have commanded you. And remember I am with you always, to the very end of the age.” Everything we need to know about what we have to do as Christians is there: Go, baptize, teach and remember. And especially, I’ve been thinking about mission because at the end of November last year, I had the opportunity to attend the Missionary Congress of the Americas in Maracaibo, Venezuela. It’s a congress that takes place every 5 years to promote missions and encourage missionaries from the whole continent, from Canada down to Argentina, including the Caribbean. There were some 4000 participants, mostly missionaries; 400 priests, 70 bishops – it was a great gathering and the motto was very simple: “share your faith”. And so I’ve been thinking about how we share our faith; or rather how we don’t share our faith. It may be a Canadian thing, I don’t know (it’s certainly different in Latin America) but either we are too afraid, or shy, embarrassed or ashamed. Or perhaps we are too “politically correct” and we really believe that we shouldn’t meddle in other people’s business. We’ve really bought into the idea that anyone can believe and do whatever they want as long as they don’t bother me and that faith is private and personal; but it’s not. We gather as Church in community because faith is public. It has to be shared. And so our idea of mission is to take school supplies to children in the Dominican Republic. We go on mission trips to build homes in Mexico; dig wells in Uganda. I went on a mission trip with a group to paint a church up in the Yukon . Don’t get me wrong, these things are important. We are called to do acts of charity. Jesus calls us to feed the hungry, clothe the naked, visit those who are sick and in prison (Matthew 25:34-40). Jesus himself healed the sick and comforted the afflicted. We must do all that, but if that is all we do, then who is preaching the good news? Who is proclaiming the Gospel? Who is making disciples of all nations? Who is baptising? Who is teaching? Who is the voice crying in the wilderness? We love that expression that is attributed to St. Francis that says, “preach the Gospel at all times and use words if necessary.” We love it because it gives us an excuse to not use words. But we must use words. I don’t even need to know my faith in order to fill shoe boxes with toiletries and send them to Honduras; but we must know our faith so we can share it. We cannot be ignorant of our faith. When I arrived in Venezuela we had to wait for two hours for the bus to pick us up and so I began speaking with a gentleman at the airport. Turns out he was an evangelical pastor. Guess what that conversation was like! He was evangelizing me and I was sharing my faith and we were evangelizing each other. It was a great conversation. We really shared a lot and I believe that we grew in communion with each other. But if I didn’t know Scripture and if I didn’t know what the Church teaches about Mary and the Eucharist and about the Papacy (because that is what he wanted to talk about), I could not have had that conversation. Could you have that conversation? We have to share our faith and we must use words. That’s what the Year of Faith was about. Remember the Year of Faith? We had three things to do with our faith: Learn about it; live it and share it. Did you take up the challenge? We have to learn about our faith. It’s not enough to go to Mass on Sundays and pay attention to the homily. We have to read Scripture; we have to study it; we have to study what the Church teaches and understand it, so we can teach it. We have to live our faith, that’s why we have to do charitable works, why we send money and resources to the victims of the typhoon in the Philippines. And we have to share our faith. In order to do that, words are necessary! And it’s not just with our family and close friends, although that’s a good place to start. We are called to go out. Pope Francis keeps telling us to go to the peripheries, to the margins. The doors of the Church have to be open so that people can go out. That is what the Church calls “missio ad gentes”: mission to those who are outside. We have to go out to the wilderness. Part of today’s readings are about that: That beautiful prophecy from Isaiah is for “all the nations.” It’s not just for the Jewish people. And Paul writes to the Romans that the promise is not just for the circumcised; the Jews. It’s for the gentiles; for everyone! Not just for those in the Church. And what does John say to the Pharisees and Saduccees in the Gospel? “Don’t think that salvation is just for you because you are children of Abraham.” Salvation has come for everyone – not just for those in the Church! And we have to go and get them. We are to happy being the ones listening to the voice crying out in the wilderness; but we have to become the voice in the wilderness. We have one mission: Go make disciples of all nations! At the end of Mass the deacon says “Go”. In Latin it used to be “Ite, missa est.” “Missa” that’s where the word for “Mass” comes from. “Ite, missa est.” It means, “Go, you are sent” or “Go, you are dismissed.” (later, when the whole celebration was called “Missa”, this phrase in Latin comes to mean, “Go, the Mass is over.” But originally it literally means, “go, you are dismissed” – “dimissa est”) The root of that word, “missa”; “Mass”, “dismissal” is the same root as the word “mission.” That’s what the Mass is all about: to send us on a mission. Everything the Church does is because the Church is missionary. The Church would not have grown had it not been missionary. The Gospels were written because the Church is missionary. The Bible was put together because the Church is missionary. The printing press was invented because the Church is missionary. Great art and sculptures and music was created because the Church is missionary. We have Mass because the Church is missionary. We have Catholic Schools because the Church is missionary. We baptise because the Church is missionary. Everything we do is because we have one mission: to make disciples of all nations and we have to become that mission.